You may be visiting today to check out the next section in my Home Management Binder as promised here, but I'm still working on my checklist and forms. I plan on having it up and ready on Monday because I need a few more days to tweak my list. This week I decided to stop pinning wonderful inspiration on my down time and actually do a project that I've been wanting to complete since the beginning of the summer. Yeah, I'm slow. I started by gathering all of my supplies, which I forgot to take a picture of. 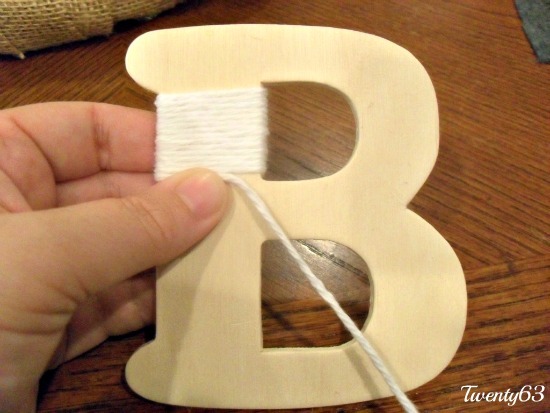 But, to complete this project I needed a wreath, glue gun, glue sticks, felt, yarn and a wood letter B for our last name. I started with this wreath, my mother in law made me earlier this year for Easter - if you're wondering, yes I just took it off the front door to complete this project. I'm a little behind on updating our seasonal decor. 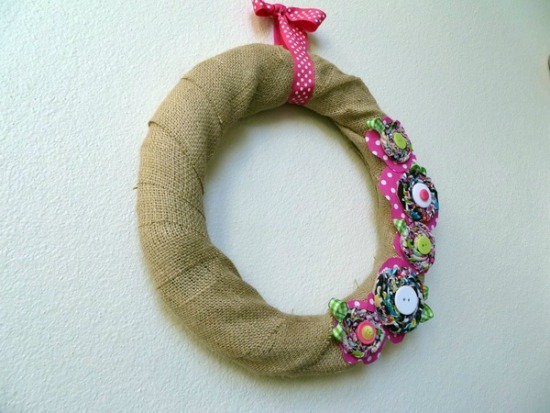 I removed all of the flowers and ribbon she glued on to get to the skinny naked wreath below. At this point, I realized I probably would want a new wreath because this one is really skinny. But, I really didn't want to buy a wreath when I had a free one. 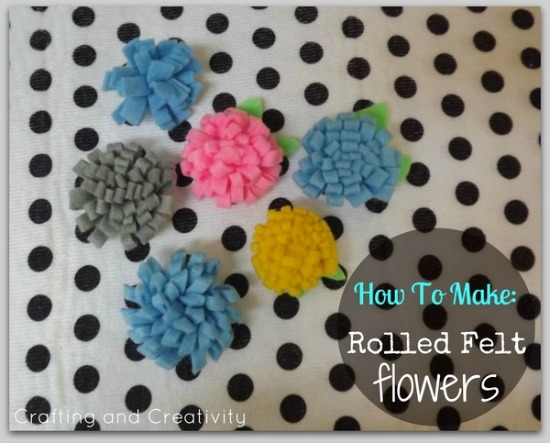 I started by making the felt flowers, which were extremely easy. In this picture, off on the table, you can see I cut the felt in strips about an inch and a half wide, give or take some. I didn't measure it, I just let the scissors do what they do. 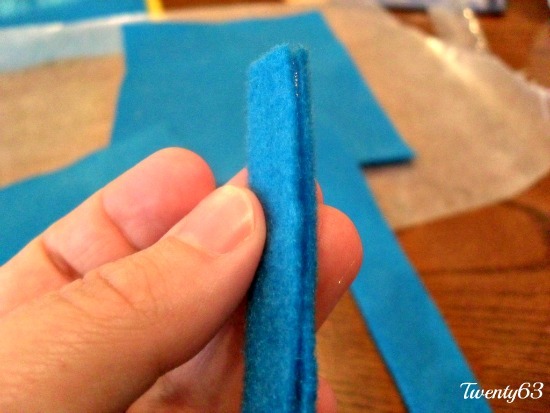 Then I placed a thin line of glue on one edge and folded it over to the other edge. Still with me? 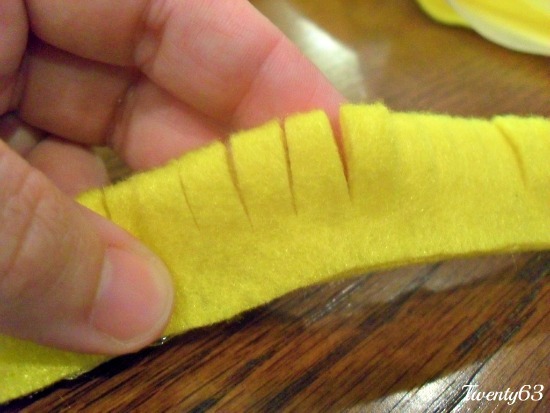 Then I cut small snips along the folded edge, it wasn't science just moved down the edge until I got to the end. Then I just started rolling until I got to very end where I placed a small dab of glue. 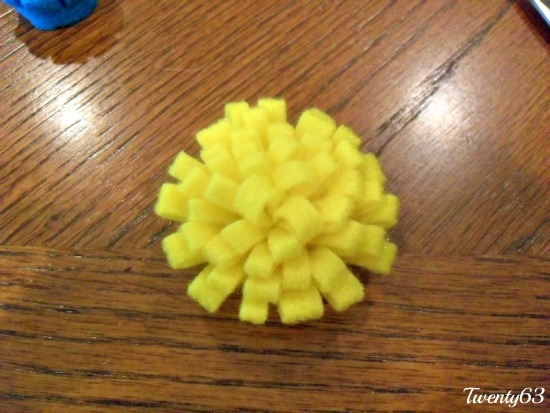 I was going to add a felt circle to the bottom, but I rolled them pretty tight so I didn't think I needed it. Love the finished product, I proceeded to make six of these. Two of each color of felt I had, gray, blue and yellow - shocker I know! After I finished all of the flowers, which took me give or take 30 minutes while watching TV, I moved on to the wood letter. This was the longest part of the project. I decided to use white yarn because I had it one hand and I wanted to add a different color to the mix. 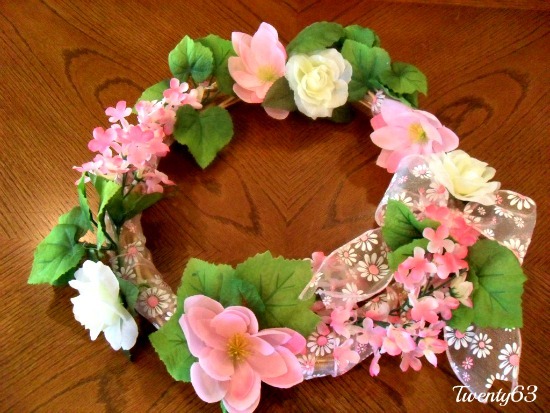 Once everything was done, I arranged all the flowers and the monogram on the wreath and hot glued it all down. 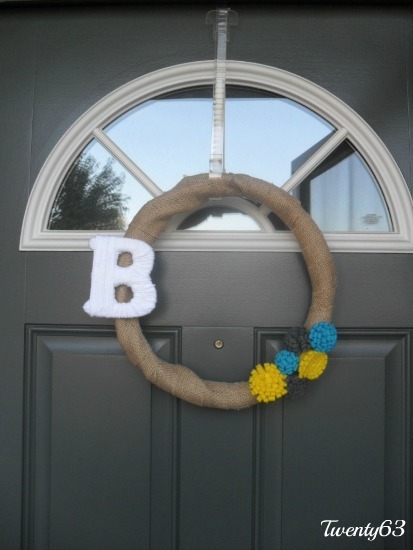 Of course I had already wrapped the wreath in burlap, I just forgot to take a picture. I'm not a huge fan of our current door holder, but until I find a better solution here is my new creation hanging proud on our front door. I absolutely love it! In the pictures the dark gray looks almost black but in person it's clearly gray. 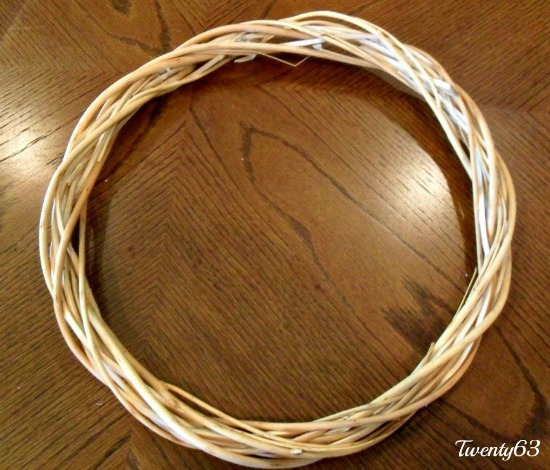 Next time I make a wreath I will buy a thicker wreath base. 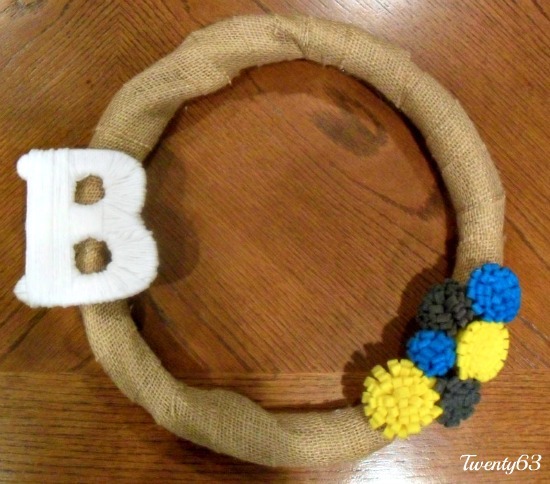 It doesn't look bad but it's a little skinny, what can I say, I like a man wreath with some muscles. 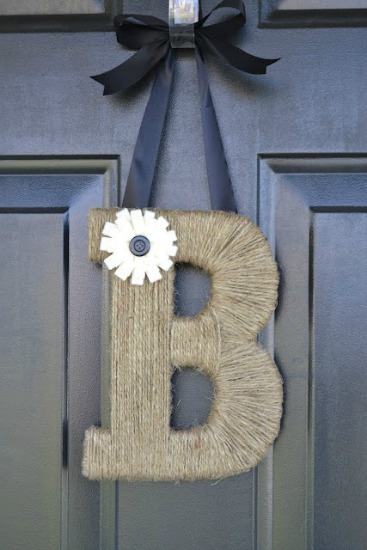 I had all of the supplies on hand except the burlap, I bought a yard at Joann's a few weeks back for $3.99 a yard. I didn't need an entire yard for this project but I am sure I will use it in the future. Now, I can't wait to get started on my next Pinterest inspired project. 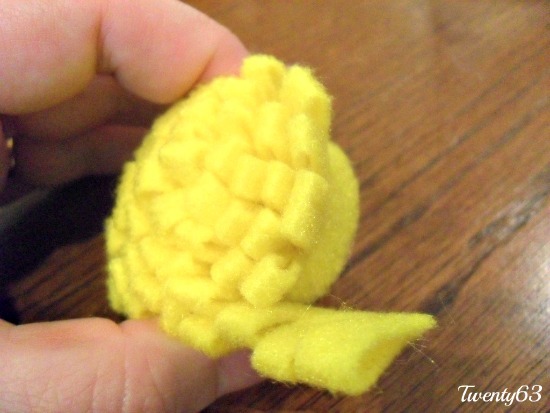 Have you completed a project inspired by the addicting Pinterest lately? If so, I would love to check it! Don't forget to check back on Monday for the next section in my Home Management Binder!